When it comes to the care of your loved ones you only want the very best. While many believe that a nursing home or care facility is the best option, the reality is that there are many downfalls to relying on this type of care. The team at OC In Home Care is happy to provide the quality care that you’re looking for, only in the comfort of your loved one’s home. Keep reading to see a few of the benefits that in-home health care has to offer. A majority of the time, when people are looking to put their loved ones in a care facility, it’s because they are in need of professional care. Having a nurse that is trained and knowledgeable is a significant perk to these facilities, but what if you could receive the same attention without taking the senior in your life from their home? In-home care allows for your loved one to have the same skilled nursing professional available, but without having to uproot their life. As we age and our life changes it can be easy to lose a routine and stop prioritizing what’s best for ourselves. Whether it’s getting ready in the morning, enjoying a decent meal, or getting some light exercise in, there are lots of benefits to having a daily routine. 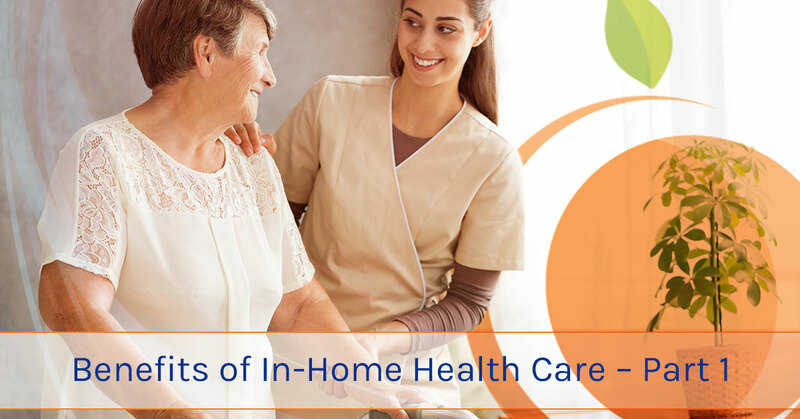 If the individual in need of care has been able to maintain some sort of routine on their own, opting for in home health care is a fantastic way to allow for them to maintain this routine while still receiving the care they need. We just talked a little bit about routine and how beneficial it can be for the elderly to have one. The reality of aging is that, more often than not, elderly individuals can complete a majority of their needs on their own. By adding a skilled, medical professional to the picture, the senior citizen in your life can go about their daily lives as normal and have help when needed. This makes for a much smoother transition to receiving assistance. In our opinion, the only way to ensure that your loved one gets the care they need is by having a medical professional dedicated to caring for them, and them alone. In-home care is a great way to guarantee that your loved one is receiving quality care from a trusted individual. This method of medical assistance is one of the few ways that you can guarantee one-on-one care on a regular basis. To us, it’s one of the reasons that this form of care is so invaluable. If you’re looking into all of the care options available to you and your loved ones, make sure to take some time and reach out to the team at OC In Home Care. Our team is dedicated to providing quality service that leaves our patients comfortable and happy. We would be happy to provide you with some information on the different types of in home care services that we offer and take care of any questions you may have. Make sure to keep an eye out for our follow-up blog on reasons that in-home care is so beneficial for your loved ones.